“No matter how hard it may seem, God in His wisdom permits painful incidents to take place.” This was how Pope Tawadros II started his talk with me. I had requested an interview with him planning to talk of a number of joyful occasions: the year 2018 marked 100 years on the establishment of Sunday School in the Coptic Orthodox Church, a huge leap in Church education; 50 years on the manifestation of the Holy Virgin on the domes of her church in Zaitoun, in apparitions which extended over a nine-month-long span of time and which brought Egyptians immeasurable blessing; and 50 years on the opening of St Mark’s Cathedral, the seat of the Coptic Patriarch, in Abbassiya, Cairo. 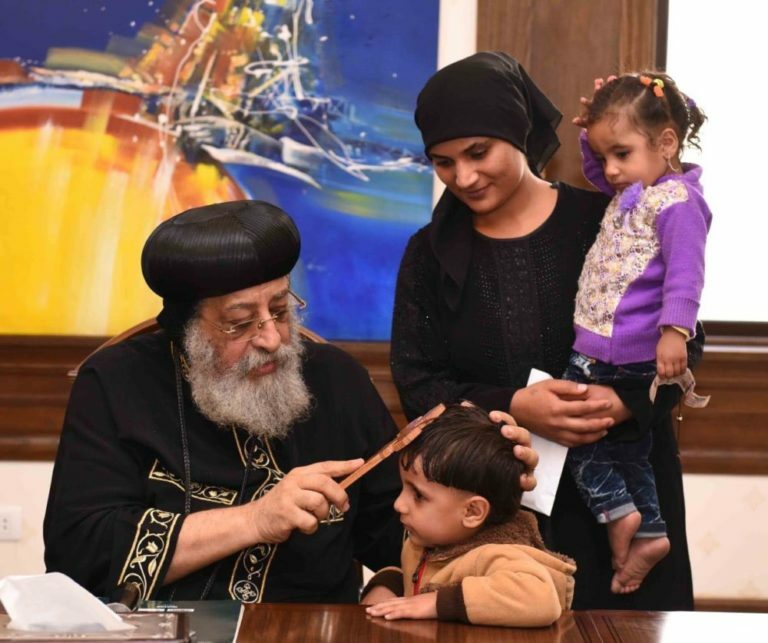 Pope Tawadros himself had over the last two years repeatedly voiced hopeful expectations of the joy anticipated in celebrating the three 2018 major occasions. But 2018 came with other than joy; it brought immense pain to Copts and their Pope. The number of prelates who passed away and were dear to the hearts of Copts and their Pope, the monastery crime that shook Copts, sectarian and terror incidents that targeted the congregation … all took a heavy toll. The most recent terror incident took place some three weeks ago, claiming the lives of seven Copts and injuring 15 others. All through the hardships, and despite his personal pain, the Pope was there for his flock: visiting, comforting, helping, and teaching in fatherly tender loving kindness. It was no surprise that many came to call him the “Pope of hard times”. “I have absolute faith,” Pope Tawadros said even as his eyes betrayed profound pain, “that nothing takes place unless God permits it. God, the Pantocrator, is the master of History; He controls the manner in which it moves. When tragic incidents occur, we take them in full faith; we pray, contemplate, and think calmly, seeking good counsel and wisdom. Only thus can we deal with the matter, and gain peace. “The history of our Church is depicted in the Synaxarium, the daily record of the saints and martyrs. It is a live testimony of the Church’s never-ending travails throughout the ages. And it should give us immunity against being broken by the hardships we face today. “We ought to be aware,” Pope Tawadros said, “that even though we Christians fall victims of terror attacks, the real target is to break Egypt. We have to fully grasp the meaning of this; sectarian conflict has been the scourge of many countries that had thrived before falling to sectarianism. Just look at Lebanon, Iraq, and Syria! We must realise that our national unity is the only guarantee to our survival. And the blood of our martyrs is never in vain. This goes for our Coptic martyrs as well as those who fall from the Egyptian military, police, or civilians at the hands of terrorists. I remarked to the Pope that present-day Copts in Egypt testify to Christ not only through the testimony of blood, but through the daily discrimination they endure on account of their being Christian. “No one can deny this long-standing discrimination,” Pope Tawadros said. “It is the outcome of centuries-old culture and thoughts that need to change. Yet, when we talk of the rights of Copts, we have to bear in mind that everything is relative. I see some improvement on that front, maybe not what we aspire for in full, but improvement nonetheless. Talking of laws brought to mind another law Copts have long waited for: the Family Law for Christians. I asked Pope Tawadros why it had not yet been submitted by the Church to the relevant authorities in order to go before parliament. “The law,” the Pope said, “has undergone long discussions among the various Christian denominations in Egypt: the Orthodox, Catholic, and Protestant. They agreed upon 90 per cent of its articles, but disagreed about 10 per cent. Each denomination has its own specifics which cannot all be included in a unified law, no matter how ardently we wished for that. There is a proposal we are now exploring: to make specific provisions for every denomination. I asked what the relation was like between President Sisi and Pope Tawadros. “It is a very good relation,” the Pope said. “The President untiringly claims he is President of all Egyptians equally, and has proved his words on the ground. We are in constant contact, meet frequently, and broach various topics, mostly on the change that takes place in Egypt and on the value of the Egyptian Church. Enough on Coptic grievances, I thought, and decided to turn to Church grievances. Coptic monastic life came under heavy scrutiny in the wake of the horrendous killing on 29 July of Anba Epiphanius, Abbot of St Macarius Monastery in the Western Desert. A monk and a defrocked monk stand trial for his murder. “So how does monastic life now fare?” I asked the Pope. “Coptic monasticism goes back 17 centuries in time,” the Pope said. “It is a tree rooted in history, and has borne and still bears plenteous fruit. But monks and nuns, individually or collectively, have always been targets to battles by Satan. This is a very well-known fact in monasteries, some even term it the ‘monastery devil’, and it is tackled through ardent prayer and spiritual exercise. Monastic life goes on in all its beauty and sanctity, despite the battles. Monasteries and convents have produced and continue to produce some very real saints. The problem of the Jerusalem Coptic monastery of Deir as-Sultan, which surfaced lately, imposed itself on the conversation. Especially that it appeared to cloud relations between the two sister Churches: the Coptic and the Ethiopian. “The Ethiopian Church was born from the womb of the Coptic Church,” Pope Tawadros said. “For centuries, it was a daughter Church to the Coptic mother Church, but now it is a sister Church; the Coptic patriarch is the 118th Pope, whereas the Ethiopian patriarch is the sixth. “Deir as-Sultan has belonged to the Copts since the 7th century, as proved by unquestionable documents and deeds. The Ethiopians are guest monks who were hosted by the Copts since the 17th century but, in 1850, thought of seizing the monastery. It took till 1970 for them to succeed in doing so through support from the Israeli authorities. In 1971, the Israeli supreme court ruled that the monastery was the property of the Coptic Church, but the Israeli government never executed the ruling. Earlier this year, a stone fell from the roof of the monastery church and the Israeli government refused to recognise the right of the Copts as owners and decided to go ahead and repair the damage. Worse, Israeli authorities treated the Copts abominably by exercising violence against a peaceful protest the Copts held at the monastery door. Obviously, politics are playing a role in Israeli decisions and acts; when the matter turns political it goes beyond reason or logic. We are confident, however, that God will resolve this problem at the right time, in a spirit of calmness and love. “During the year,” the Pope said, “ The Church lost Anba Boqtor, Bishop of al-Wadi al-Gadeed; Anba Fam, Bishop of Tema; Anba Antonios, Bishop of Manfalout; Anba Arsanius, Metropolitan of Minya and Abu-Qurqas; Anba Epiphanius, Abbot of St Macarius Monastery; and Anba Bishoy, Metropolitan of Dumyat and Kafr al-Sheikh and the Prairies. “Consecrating a new bishop is no easy matter; we leave it in the hands of God. We pray hard for that matter. We ask the parishioners concerned or the monks for nominations, investigate the matter in the Holy Synod, meet eligible candidates, declare the names to the Holy Synod and ask for any remarks, then announce the name of the bishop-to-be on the eve of his consecration. This would be Saturday 24 November; the consecrations will be concluded during Sunday Mass the following day at St Mark’s Cathedral in Abbassiya, Cairo. There has been much talk lately about the Melli councils, which are community lay councils that should help run the Church. It is not clear where they now stand. Pope Tawadros explained that the Melli councils played an important role in the Coptic Church during the first half of the 20th century, till the Egyptian government decided that family disputes should be looked into by ordinary courts of law and not by religious authorities. Following that, the role of the Melli councils was restricted to a few financial or administrative aspects and managing the Church’s property, which is no mean task. However, there was occasional conflict between them and a number of patriarchs, so they were discontinued till Pope Kyrillos VI, patriarch from 1959 to 1971, revitalised them. The last Melli Council’s term ended during Pope Shenouda’s last days in 2012, and no new council was elected. But the law says that the old council would be still in force, for there did not seem to be a problem. “We are considering, however, running elections for a new council, but are thinking of changing its name. ‘Melli’ denotes a specific sector of people, and implies division or categorisation. I have asked those in charge to suggest a new name that does not imply sectarianism. As my interview with Pope Tawdros approached a close, I asked what his hopes were for the upcoming new year. A smile lit his face as he said: “I wish that the new capital of Egypt would near completion. The State has allocated 30 feddans of land for a papal headquarters and administrative building to be annexed to the Cathedral there. “I also pray for peace for our land, and that the Lord should protect Egypt and give her victory in her battle against terrorism, and good fruit in her endeavours at development. God preserve Egypt, her Church, and her people.